This year I seem to have gone advent crazy. 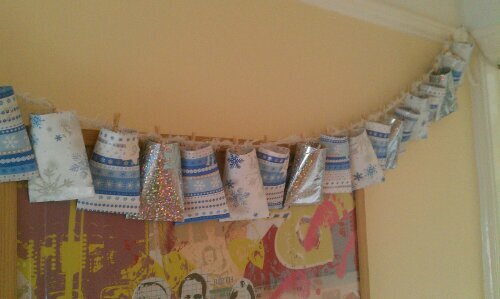 We actually have eight advent calendars in our house of one sort or another. 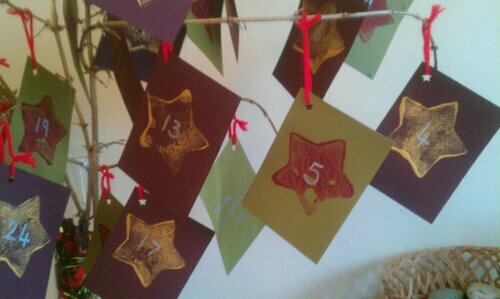 Firstly we have the advent activity tree. Then we have a magnetic nativity scene which I’ve had since before we even had children. 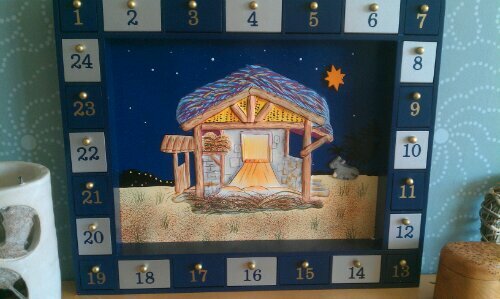 It’s looking a bit sparse at the moment but everyday a person or item from the nativity arrives to fill it up. 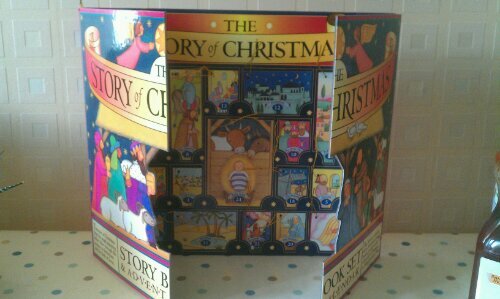 This year I also bought the story of Christmas advent book after recommendations from the fabulous The Imagination Tree. 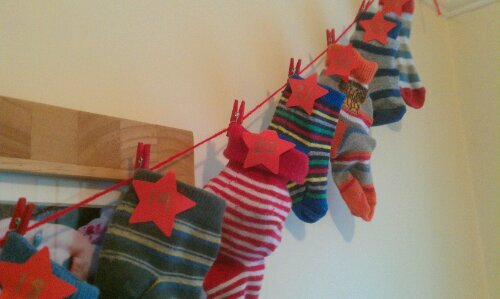 Then The Limpet has her own advent calendar containing a small gift each day. I made it last year for her and its made from toilet rolls stapled together at the end and then wrapped in Christmas paper and numbered. This year I’ve also made The Gannet his own one – he was too young last year. 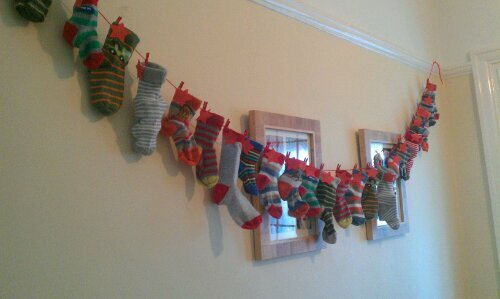 I’ve made his out of all his old socks. It looks quite cute and is a great little reminder of his growth though the last year. 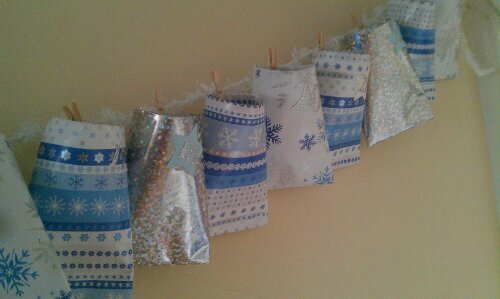 My husband then decided that they needed a conventional chocolate advent calendar each. And the last calendar is a countdown one which we made at toddlers. So that’s eight in total! Whilst reading through other patenting blogs I discovered a link to the worldwide culture swap. I immediately signed up for it. After signing up you get linked up with 4 families from around the world. We got families from Australia, South Africa, Ohio USA and California USA. It’s a fabulous way to learn about other countries and their traditions directly from the families themselves. And let’s face it – everyone loves receiving parcels in the post. But actually, its just as fun to give as to receive. As the monsters are quite young they couldn’t really help me with ideas but I used the experience to teach them about our own culture and history. I had great fun putting together our 4 packages. I included postcards and leaflets from our town and county; a colouring in book of native animals; a Paddington Bear visits Buckingham Palace book; London stickers; a toy London bus and a stick of rock. I also put in some maps and facts about our country and details about traditional food and famous people. And finally some family photos and details about ourselves and our house. My first born baby recently turned three, doesn’t time fly when you’re having fun?! We were actually on holiday over her birthday so it was a bit different to normal birthday celebrations. But before we left I was determined to make her a birthday T-shirt with my new sewing skills. Unfortunately this was my first attempt at doing sewing in anything but a straight line. It turns out that a number 3 is incredibly curvy and was a bit of a challenge! I first made one for my son’s birthday and love this new little birthday tradition. I was inspired by these wonderful creations that are made by loving siblings on itstwoam. I’m too controlling to let the kids take over this activity just yet! But when they are older I think it’ll be a lot of fun.